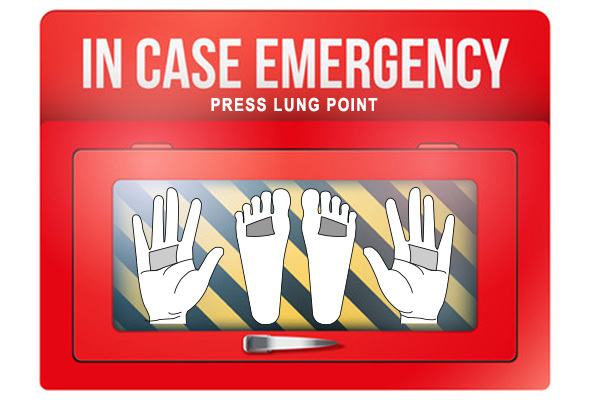 If you’re a firefighter, volunteer, evacuee, or you live in a community affected by the fires, massage this Chinese Reflexology point to help counteract the effects of smoke in your lungs so that you can breathe more easily. Huge wildfires are burning in Northern California right now, displacing tens of thousands of people, destroying thousands of homes and businesses, and resulting in numerous injuries and at least 34 people killed (as of the time writing this article). Because of the proximity of the Tubbs fire to the San Francisco Bay Area, there are millions of people impacted by some of the worst air quality levels recorded in history. I live almost 100 miles south of the fires, yet I was shocked when I stepped out of my home on Wednesday. The air was so bad, it felt like I was standing next to a campfire. By the time I walked to school to pick up my son, my eyes were burning. Friends with asthma are driving to work wearing industrial grade gas masks. Children with sensitive lungs are experiencing chest pains and breathing difficulties. 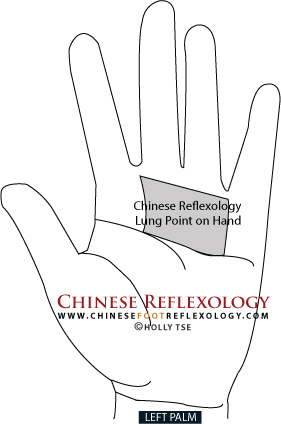 For anyone suffering from the smoke, there’s a Chinese Reflexology point that can help. This point gives your body a qi (life force energy) boost to help clear the effects of the smoke from your lungs. Think of it like a natural supplement to soothe your lungs and help your body repair itself. I recognize that there will be a lot of people reading this article who were forwarded this link from a friend. You aren’t a regular reader of my blog and you may not believe in alternative healing. It doesn’t matter if you don’t believe in it. It still works. Try it because it’s free and takes less than a minute. Try it because your friend sent you this link for a reason. Try it because Chinese Reflexology works. My article on reflexology points for cold recovery has been shared over 7,820 times—not due to any promotions or advertising, but purely from word of mouth—because it works. You’re going to learn the most powerful point from that article to help you breathe more easily. You do have to massage the point regularly for the maximum impact. But if you’re in the middle of a hack attack, pressing on these points can help you stop coughing. Please note that this reflexology routine does not replace medical treatment for respiratory conditions or the need for a proper facemask. There are two ways to massage this point: on your foot or on your hand. The best way is to massage the foot point because the points on the feet are more powerful and effective than the ones on the hand. That said, it might not be convenient to rub your feet, so in that case, massage the hand. The Lung reflexology point is an outstanding standalone point for boosting your Lung qi, which helps soothe your lungs, and strengthen and protect them when they are exposed to particulate matter in the air. Location: On soles of both feet. It’s a rectangular-shaped area on the ball of the foot below the three middle toes. How to massage: To massage this area, wrap the fingers of both hands around your foot, and then press deeply into the area with both of your thumb pads. Massage in small circles, making your way across and down the entire lung area. Be sure to massage the entire Lung area on both feet for a total of 60 seconds per foot. How often to massage: If you’re right in the thick of things, you can massage this point up to four times a day. It’s best to massage at least an hour away from meals. Also, drink lots of warm or room temperature water to help your body flush out toxins, and rehydrate since water is the counterbalance to fire. While the foot point is best to massage in terms of effectiveness, hands down, the hand point is best for convenience. How to massage: Press into the point with your thumb pad and massage in small circles for 2 to 3 seconds. Work your way across and down the point, and do this for about 30 to 60 seconds per hand. How often to massage: The padding on the hand isn’t as thick as on the soles, so only massage this point twice a day. Follow the recommendations to massage at least an hour away from meals. Also, drink lots of warm or room temperature water. BUT, since the hand point is very convenient to massage, you can ALSO massage this point “here and there” for 3 to 5 seconds throughout the day. Massage when you cough or your lungs feel extra sore. Sonoma County Resilience Fund – Their focus is on providing support after the immediate crisis, for mid-term to long-term rebuilding of communities. Redwood Empire Food Bank – The Food Bank needs financial assistance immediately to provide food for evacuees living in shelters. In addition to Northern California, there are other communities in the U.S. and around the world that have also been hit by natural disasters. The Red Cross has the experience and infrastructure to support people during natural disasters. Please consider making a donation through their website.